During the autumn of 2017, my husband decided to take me to visit the Balkan, Our itinerary included Montenegro, Croatia and Slovenia. While we were in Dubrovnik and saw some day trip getaways, it was just a sudden plan to take a trip to Bosnia & Herzegovinia. 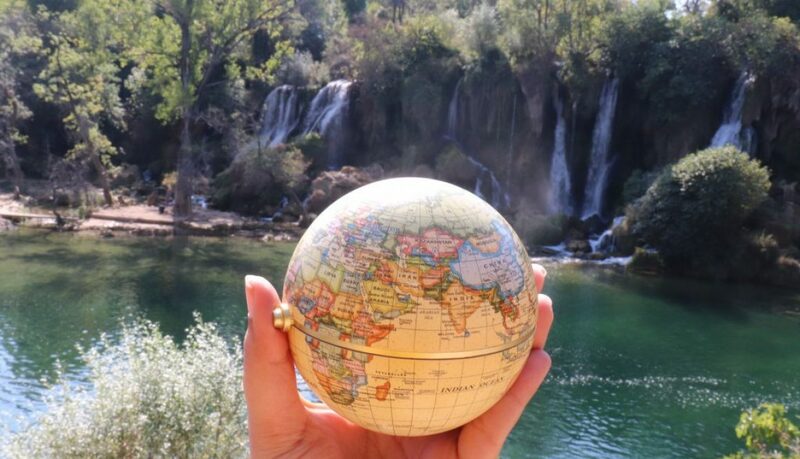 And I am so thrilled we did this one, as Kravice and Mostar Bridge are truly hidden gems. This country has always been a stage of war. 104 years ago in June 1914 Austrian Arch Duke Franz Ferdinand was assassinated in the capital Sarajevo, and thus began the First World War. Following the dissolution of Yugoslavia, the republic proclaimed independence in 1992, which was followed by the Bosnian War, lasting until late 1995. During the 80 s and early 90s because of its geographical region sandwiched between the Serbs attacking the Croats and Croats defending themselves several innocent civilian lives were lost. The war between Croatia and Serbia completely destroyed Bosnia. A country having a monthly income per person of 2000 euros, today has 50 euros monthly per person. However the country and their people are slowly picking themselves together and rebuilding brick by brick with the help and support of the United Nations and various other nations as well. Having seen pictures of Kravice and the beautiful Mostar Bridge we decided to do a daytrip. Our first stop was the beautiful Kravice waterfall. To me this waterfall was prettier than Niagra. The beautiful green colour of the water with reflection of surrounding nature sure was a mesmerizing sight. This place is actually called Niagra of Europe. However in this poverty stricken land food and alcohol is very reasonably priced. People here want others to give them business in order to have some kind of livehood. While you walk towards the waterfall viewing point there are a few shops, which sell home, made jams, honey and locally distilled liqueurs. The price point for some of these items is in the region of 1 Euro to 5 Euros approximately. Tourists do enjoy taking a dip in the calm green waters, when it is summer and water temperature is enjoyable. The most famous attraction here is the Starri Most. When you see the bridge from the bottom, there is a beautiful arch, many buildings, including a minarat and a whole lot of greenery. The turquoise blue colour of the water is so inviting. But the water is freezing cold. Here locals to clean the place up have a tradition of jumping off the bridge. All the tourists who are there collectively give them 10 euro per jump. Infact even the people who jump off the bridge, definitely need to shower, in order to regulate their body temperature, before they take the plunge. The vibrant humanity and the persistent reminders of the terrible war during the mid 1990scombine to make Mostar a tear jerking experience when you leave the place. It is truly emotional even for the guide when they explain to tourists on a daily basis. The bridge was destroyed during the war and has since been rebuilt and open to public in 2004. In 2008, it has been declared a UNESCO world heritage sight. Prior to the war, Mostar was famous for its Turkish style stone bridge, which was nearly 4 centuries old. The single-pointed arch was a symbol of Muslim society’s existence here. The architecture was an absolute marvel. It also signifies the town’s status as the place where East met West in Europe. In the mid 1990s, Mostar became a poster child of the Bosnian war. The shops here definitely had a bit of Turkish influence like cobbled streets; they were more like roadside shops and a bazaar like atmosphere. You could definitely get some good bargain buys here. Some of the famous local items could include rugs, pottery and jewelry. There are lovely little riverside cafes where visitors could relax and have some delicious Turkish coffee. We had a lovely tasty Bosnian lunch which included a couple of drinks along with starters like pita bread, harissa dip, and hummus.and main course dishes included lamb shwarama and shish touk for two people, all this along with Kawah (Turkish coffee) just for 10 Euro which in Croatia would easily be double to triple the cost. On our way back to Dubrovnik we stopped at Pocetlji; a small Bosnian town on the Herzegovina side. It was a beautiful old mosque on one side and a bell tower on the other. Again here there was lovely Turkish accessories, and a lot of fresh fruit juices and jams. If your fond of fresh rasberries, you can get almost a ½ a kilo for just 1 Euro. Take some back and enjoy your bus ride back to Dubrovnik. Since borders are close by it is important to carry passports and other documents for verification purposes. You may not be able to bargain too much in Croatia or Montenegro but one can certainly bargain in Bosnia but you do feel bad if one overdoes it given the state of affairs and socioeconomic scenario there. Walk carefully on the cobbled steps as you approach the bridge, as it can get slippery. If you tell someone your visiting Bangkok, I am sure they will say, “You must visit a floating market”. I actually heard this comment when I told someone, I just returned from Bangkok. And when my reply was, “No, I didn’t go”, they were like, “Oh noooooooo”, you missed something really fun, a fabulous experience”. The truth is I did want to visit, but to do that, you need to start your day before sunrise. On my first visit, my laziness got the better of me. So on my second visit to Bangkok, just a couple of weeks ago, I decided to visit these colorful markets. As soon as I arrived into Bangkok, the first thing I did, was got on to the internet and booked a floating market tour. I decided to visit Damneon Saduk Floating Market. This was basis all the reviews I read. This market is one of the most visited floating markets, and one of the biggest, in and around the vicinity. This tour costs approx $80 with a pick from most hotels in the city. This market is approximately 2 hours from the main city. I started reading a little bit about what these markets are, and why they are so famous. There is a long history behind why Thailand has these markets? A lot of Thailand including Bangkok, are in the low wetlands, the area around is jungle and has a tropical climate. When Thailand first got inhabited, the first areas to get populated were around these rivers. Boats would be the main mode of transport and trade would take place in them. Even today, these boats which are so colorful and all dressed up, are an interesting trade, and attracts lot of tourists. The day arrived and I was all excited to go visit this vibrant and colorful place. The bus came and picked me up from the hotel itself. Tour operators are very punctual and arrive atleast 15 mins before your pick up time. Why I am emphasizing this is because, I met a girl Slava, from Slovakia, who was on a 3 month South East Asia tour, and she was quite surprised because in Mynmmar her tours always started an hour or more later. THAILAND IS ON TIME !! Before the floating market, the tour takes you to a coconut plantation. They tell you how coconut sugar is made. Your get to try it out, and it tastes super yummy. I request you to only buy sugar from there and nothing else from the market in the plantation, because you get a lot more variety at the floating market. To enter the floating market, there are 2 ways, the bus directly takes you to the spot, or you sit in Thai speed boat, and ride through the canal, with beautiful views of authentic Thai houses and lifestyle. Tip: Please carry a waterproof camera, as a lot of water splashes inside the boat. On the tour I made friends, with Slava, who I mentioned earlier. We decided to explore the market together. The point where the boat stops there are very few other boats selling goods. Thats not the actual market. You need to walk a few hundred meters and then you reach multiple souvenir shops. They sell everything right from Jade Buddha to goodies made of coconut shell, to batik dresses, costume jewelry, bags and the famous tuk tuk. As we move further we could pose with the python and hold a lemur (pic with a baby monkey). At first we were very scared to take a picture, because we noticed a few people who would hold him, he didn’t let go of them. So we moved ahead and entered where the boats with traders begun. But before that you need to stop at a picture point (your at a height) and the floating market below you), and pose. Then we walked down the steps, just to enter a place so vibrant, colorful and full of life. The merchants in the boats sell thai fruits, corn, vegetables. On either side there are food stalls where you get to taste delicious thai food. Slava and me had some pad thai, and thai tea.we were sitting there and just soaking in the vibe of this very gorgeous place. We took a lot of pictures. The merchants in their boats will pose for you. At such an awesome place you don’t even realize how time flies. On our way back up we ate some Dosa with egg yolk filling, that slightly sweet and Slava ate the one with carrot and basil. That is savory and a bit spicy. These dosas are unique, and are a speciality here. You can have pancakes too. TIP: Please do not eat breakfast. There is a whole lot ion great food in the market. Carry cash with you, most places do not accept credit card. Bargain at the souvenirs shops, slash the price by atlas 60% when you start. You by the end will pay 40%- 45%less than quoted price. Don’t eat breakfast and come, there are lots of thai delacies in the market. I recommend to take a tour and not travel on your own, as its very far, your taxi bill will be 3 times the tour cost. 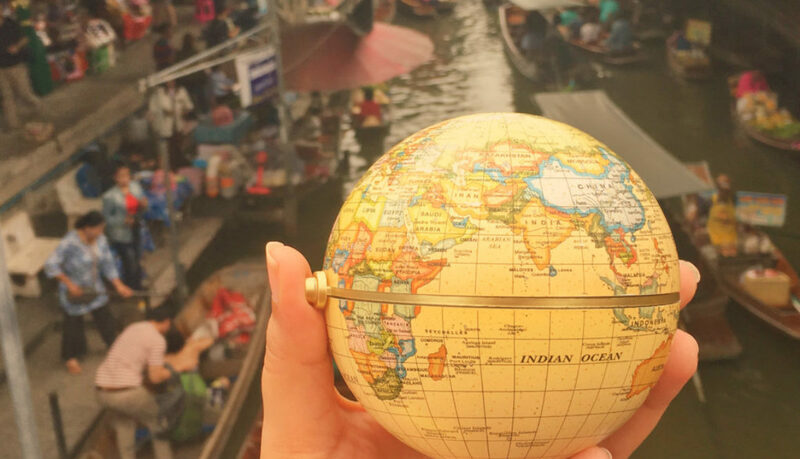 Take a tour that makes you experience the thai boat through the canal to reach the market. If you wants pictures of the canal while your in the boat, carry a waterproof camera. Where shorts or 3/4th as in the boats you need to sit crossed legged and bottom of pants if full, will sure get dirty. Yes a floating market is a check on the bucket list!